When Joel Quenneville was relieved of his head coaching duties in early November, the decision was bittersweet. He certainly delivered great moments, but the team had hit a rut and was in desperate need of change. Chicago hasn’t advanced past the first round since 2014-15 and missed the playoffs entirely last season. Prior to his firing, the club was sitting on a 6-6-3 record and seemed destined for another disappointing year. Nevertheless, it felt as though his departure would mark the end of a Blackhawks era. After all, the most successful stretch in franchise history — which featured three championships in six seasons — unfolded under his rule. It arguably started with his introduction as bench boss. While there’s still talent on the roster, salary-cap attrition has ravaged its depth and exposed its flaws. Moreover, core members of those title squads are showing their age. 33-year-old Brent Seabrook has been running on fumes for quite some time now. 35-year-old Duncan Keith was arguably the most important figure throughout the Blackhawks’ deep playoff runs, but he’s slowed down in the past two seasons. Once he lost a step, opponents began poking holes in his uniquely aggressive style. The party finally appears to be over. Even if hard times are on the horizon, though, Chicago isn’t ready to turn the page on its current generation. After winning seven straight games, the club is only four points out of a wild-card spot. Better yet, the bubble teams in the West have stalled and are begging to be overtaken. The Blackhawks are happy to oblige, but make no mistake: Their surge up the standings isn’t the result of cohesive team efforts. It’s been fueled by pure offense. Over their current 13-5-3 run, they’ve conceded an average of 3.24 goals. However, they’ve filled the opposition’s net 3.95 times per contest to get the upper hand in these high-event affairs. They no longer boast the personnel to shut other teams down or dictate the lion’s share of the play (48.6 CF%, 46.8 SCF%), so they’re tipping their scale toward the attack in order to maximize the impact of their assets. Unsurprisingly, Patrick Kane (81 points in 55 games) is leading the charge. The 30-year-old winger has posted a ridiculous 42 points in his last 20 outings and looks electrifying every time he takes the ice. His elusiveness, vision and hockey sense remain world-class and have propelled him to second in league scoring. Kane has actually produced his strongest individual years at the tail end of Chicago’s title window, so it’s fitting that he’s at the heart of this offensive explosion. At 5-on-5, the Blackhawks control just 47.4% of the shot attempts and 45.9% of the scoring chances during his shifts. However, they control 53.9% of the goals. That speaks to just how lethal Kane is as both a playmaker and finisher. Chicago isn’t afraid to lean on the superstar either, as Kane ranks fifth in ice time among NHL forwards…as a winger. His 22:16 of action per night is two minutes higher than last year’s average. Head coach Jeremy Colliton is rightfully giving his game-changer every chance to make a difference. The new bench boss has also gone back to a formula that Quenneville was reluctant to deploy on a consistent basis: Pairing Kane with Jonathan Toews (56 points in 56 games). The two would often be iced in high-pressure situations, but for the sake of balance, Chicago’s best forwards haven’t been regular linemates for ages. Colliton recently slotted them together, and it’s worked very well — especially for Toews. Kane can perform with nearly anyone by his side, but the captain hasn’t been as productive since Marian Hossa declined and eventually disappeared. With a player of Kane’s caliber on his wing, opponents now have to respect another threat. That additional room has allowed Toews to flash his nose for the net and generate 25 points in his last 18 games. While Chicago’s overall defense has gotten dramatically worse over the years, its leader also remains effective in that area. His three-zone responsibility is particularly useful with Kane flanking him, as it ensures that the team isn’t just exchanging goals with the opposition. As a duo, they’ve posted a stellar 54.8 GF%. By comparison, the Blackhawks are sitting on a 47.4 GF% (24th). Toews and Kane aren’t the only forwards playing great hockey. Youngsters Alex DeBrincat (53 points in 56 games) and Dylan Strome (30 points in 32 games as a Blackhawk) are doing their part to power Chicago’s postseason push as well. In his second year as a pro, DeBrincat is emerging as one of the game’s brightest goal scorers. He potted 28 goals as a rookie and has equaled that mark in only 56 contests this season. Despite his diminutive frame (5’7”, 165 lbs), the 21-year-old winger isn’t afraid of working himself into the dirty areas and battling for loose pucks around the crease. As a right-handed shot with a quick release, he represents a terrific one-timer option for Kane to exploit on the power play too. Meanwhile, Strome was on the verge of bust territory in Arizona only months ago. The third overall pick in 2015 mustered 16 points in 48 games across three seasons with the Coyotes and simply couldn’t unlock his full potential. A trade to Chicago and a familiar face have done him a world of good, as he and DeBrincat — former Erie Otters teammates — have picked up right where they left off in the OHL. With that familiarity in tow, Strome’s confidence has never been higher. The 21-year-old has always possessed the tools, but he seemed to process the game rather slowly in Arizona. He’s now showing faith in his instincts and trusting DeBrincat to be where he needs to be, which has sped up his decision-making and sharpened his execution. This mutually beneficial relationship has yielded a 54.3 GF% and actual cause for optimism in Chicago. These kids could very well headline the next wave in Chicago. Until then, they’ll offer their support to Toews and Kane in the heat of their playoff chase. The offense will need all the help it can get because the defense won’t be of any assistance. Rookie goaltender Collin Delia (2.98 GAA, 92.3 SV%) has fared well, but the roster isn’t built to rely on him. In the end, Chicago must ride this scoring eruption for as long as it can. It’s unlikely to last, of course. Kane is burning too hot to even comprehend at the moment. The power play has converted on 37.9% of its opportunities since mid-December. The team has also proven to be rather streaky this year, losing at least consecutive five games on three separate occasions. 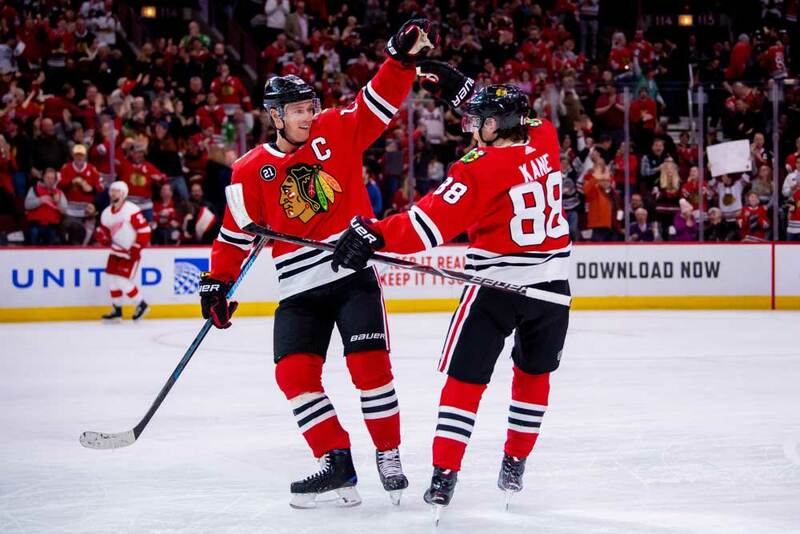 The Blackhawks’ run is probably unsustainable. Honestly, they should probably start thinking about their rebuild. But following such a successful decade, you can’t help but admire the fact that they’re still fighting. They’ve earned one last kick at the can, and they’re going down swinging.